Based on the Alfred Hitchcock classic, the hero Richard Hannay must solve the mystery of The 39 Steps to acquit himself of murder and save King and country! This brilliant comedy thriller features four fearless actors, playing 139 roles in 100 minutes of fast-paced fun and thrilling action. At the time of the interview, Rufus Wright was starring as Richard Hannay in the classic comedy The 39 Steps at The Criterion Theatre, which recently celebrated its 2,000th performance. This is some way from where his career first started, which was at the age of twelve at The Hurlingham Club in West London, performing in classics such as Godspell. Rufus commenced his formal performing arts training at Warwick University, where in addition to his degree course, Rufus received funding to start a student theatre company that performed Athol Fugard’s plays, and during this time he learnt a huge amount from directing and acting. From making his professional debut at the London Pleasance Theatre, Rufus has now established himself as an actor with numerous credits on the stage, television, film and radio. Highlights of his career to date would make many aspiring actors green with envy. Read on to find out what Rufus had to say about himself and his career as earlier this week he answered some questions that I put to him. You are the son of an army officer and were born in Germany. What was it like growing up as the son of a Major-General and travelling around the world when your father was re-posted? I’d lived in 14 different houses by the time I was 13, the main effect was to encourage me not to put down roots. Even now, I don’t have an answer to the first question anyone asks: ‘Where are you from?’ That’s a bit odd, but it helps me as an actor, I don’t feel I’m from anywhere, so I feel I can come from anywhere. And being the son of a General was always pretty cool growing up. He’s 81 now, and he and my mother married 51 years, have been enormously supportive of my career from the start. At what age were you when you first showed an interest in acting? Around 12, at school, and also a posh members’ club my dad used to work at after he retired from the army, The Hurlingham Club. We used to do Lloyd-Webber musicals, Godspell etc. It was exciting feeling I had a hundred or so adults in the palm of my hand. Was there anyone in particular who inspired or motivated you to become an actor? Not really. I never had many huge heroes in movies when I was younger, and although I had some great teachers, none made me stand on my desk and recite Captain, My Captain…. You trained at Warwick University and The Central School of Speech and Drama in London, what are your favourite memories of those times? Warwick was wonderful, a fantastic university with huge encouragement for students to anything they put their minds to. I received funding to start a theatre company that performed Athol Fugard’s plays, about apartheid South Africa, in prisons and schools. I learnt a huge amount from directing and acting in student plays. The course I did at Central was a Postgraduate course on which they worked us very hard but it was very unusual, lots of devising and discussion, but not very much classical grounding. I learnt a lot though, and would always recommend at least a year of training to people interested in acting. Where did you make your professional debut, and what was the role? Aumerle in Richard II at The London Pleasance. A lovely first role. On stage a lot to watch everyone else and learn a lot, but not too much to do! My Richard was a terrific actor called Richard Hansell, and ten years later we played Edward VIII and George VI opposite each other in Crown Matrimonial. With Patricia Routledge as our mum- Queen Mary. Can you describe what it was like when you made your West End debut? I took over the part of Hibbert in Journey’s End. It was a thrill, but mainly because I adored the play so much and loved the subject matter, the trenches of the First World War. We were at the Playhouse Theatre, which is slightly out of the way, so didn’t feel part of the West End in the way you do when you’re on Shaftesbury Avenue. I was also living in the West End at the time, so walked to work. It was a very happy time. What was the audition process like for The 39 Steps and where were you when you found out that you had got the part? I had 3 auditions, an agonising process of being whittled down from dozens, to ten, to three. At the final audition I met Patrick Barlow, who’s been enormously supportive from that moment on. They certainly kept me waiting before the final offer came through, I was getting pretty nervous, I was walking along the Goldhawk Road when I finally got the call. You have been starring as Richard Hannay since February 2011, what have the past five months been like? Exhausting. My wife had our first baby 14 days before rehearsals began, so 6 day a week physical theatre rehearsals combined with a beautiful but very small and colicky baby was pretty demanding. Once we opened, things calmed down a little bit, but it’s still hard. But the job is terrific and I’m enjoying every moment of it. John Buchan’s original book The 39 Steps was written nearly 100 years ago, what is it that has made the story last and become a classic? A friend gave me a complete set of all the John Buchan books in Penguin Classics- the classic orange and white covers, so I’ve now read them all, and it’s hard to categorise their appeal. Hannay doesn’t have the style and success with the ladies that Bond has, for example, but there’s something uniquely British about his attitude. Of course, sometimes it comes across as dated, most wily foreigners get a well deserved sock on the jaw, but you can’t help but read on. Our 39 Steps bears very little relation to the book, it’s a very close adaptation of Hitchcock’s film. But Buchan himself very gallantly said that he preferred Hitchcock’s story to his own. 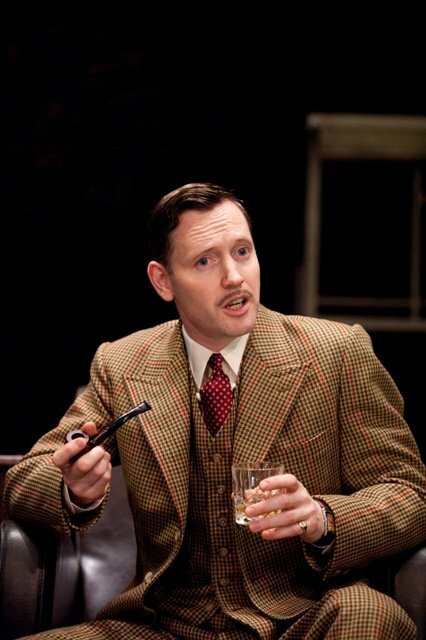 How would you compare the 39 Steps comedy at The Criterion Theatre with the film versions? I’m afraid to say I only know the Hitchcock. As I mentioned above, we follow it very closely in terms of plot, but of course play the comedy a lot more. But as actors we’re told to play the stakes of the thriller to the hilt. It’s only funny because we are trying so hard for it not to be funny, if that’s not letting daylight in on magic. I haven’t seen the Kenneth More or Robert Powell versions. Maybe I ought to: I’m never sure. The 139+ characters in The 39 Steps are played by four actors and is also a physically demanding play. How long did it take you to feel ‘comfortable’ in the role? The other three actors are the ones with all the characters to play – fortunately I’m Richard Hannay throughout. As to feeling comfortable, it came with time and work. You have appeared on the stage, television, film and radio. Do you have a preference for any one of these? What are the highlights of your career so far? Stage work is the most rewarding and enjoyable. The instant response of hundreds of people is enormously exciting. But of course each line of work has its pleasures and advantages, and stepping onto the Bond soundstage at Pinewood is pretty amazing too. Not wishing to name drop, but you have appeared in films with Brad Pitt, Robert Redford, Dame Judi Dench, Daniel Craig, Michael Sheen and Dennis Quaid. What has been the highlight of your film career to date? A scene with Robert Redford in the spy thriller Spy Game when I was still pretty green was fantastic. And my brief appearance in Quantum of Solace was certainly a highlight. Michael Sheen I’ve worked with in the theatre and we’ve been friends for some time, so working with him in his final outing as Blair was terrific. You appeared in the TV comedy series Miranda, what was it like performing with such comediennes as Miranda Hart and Patricia Hodge? They’re terrific. It’s exciting learning from people in every job you do. Miranda’s a live studio audience sitcom, and I’d never done one before, so it was fascinating to be a part of. If you could choose anyone, who would you most like to appear on stage or film alongside? I’m a huge fan of Paddy Considine, although he’s turning to directing a lot more now. And in the US, it would pretty much be the cast of Boogie Nights: Philip Seymour Hoffman, William H Macy, John C Reilly, Julianne Moore, Mark Wahlberg. All extraordinary actors. And my favourite directors I think are Paul Thomas Anderson and Chris Nolan. Richard Hannay is obviously a fun part to play and long may you remain in the role, but do you have any particular career ambitions that you would like to fulfil? You are married to actress Melanie Gutteridge and have a young son Jasper, what do you do to chill out as a family? We’ve had no time as a family away from 39 Steps yet, but we had a brief holiday and visited Cornwall, where we go as often as we can, and the Gower Peninsula in Wales. Melanie’s keen to get back to work, so maybe next year she’ll be away ‘shouting in the evenings’ as David Troughton once described acting in the theatre, and I’ll be looking after the baby. Anything else that you would like to add or a message to your fans? Come and see The 39 Steps! It really is a terrific night out. Last week we had our 2000th performance. We are one of only 15 straight plays to achieve that since the start of the 20th Century. There’s something unique about the show that I can’t quite put my finger on. But my elderly father and my 7 year old niece have both been twice and like arguing about which is the best bit. 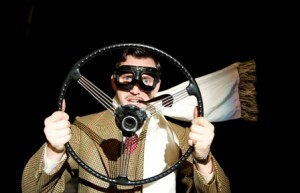 Rufus trained at Warwick University and The Central School of Speech and Drama. Theatre credits include: Capt Simon Mannock in THE EMPIRE (Royal Court), Jake Todd and others, SERIOUS MONEY (Birmingham Rep), Victor in PRIVATE LIVES (Hampstead Theatre), Edward VIII in CROWN MATRIMONIAL (No.1 Tour), John Birt in FROST/NIXON (Donmar Warehouse/ Gielgud), Sir William Davison in MARY STUART (Donmar Warehouse/ Apollo), Hibbert in JOURNEY’S END (Playhouse/Duke of York’s), Sandy in HAY FEVER (Basingstoke Haymarket), The Duke of York in THE MADNESS OF GEORGE III (West Yorkshire Playhouse/Birmingham Rep), TRUST BYRON, LIFE WITH AN IDIOT, FRANZISKA, (Gate Theatre), SINGLE SPIES (West Yorkshire Playhouse), THE LAST SORTIE (King’s Head Theatre), THE SECRET GARDEN (Salisbury Playhouse) THE BACKROOM (Soho) and RICHARD II (London Pleasance). Television credits include: Miranda, White Van Man, Five Daughters, The Thick of It, Taking The Flak, The Bill, Fanny Hill, Doctors, Extras, The Quatermass Experiment, P.O.W., The Secret, Bomber, Boyz Unlimited. Film credits include: The Special Relationship, Quantum of Solace, Spy Game, Swinging with the Finkels and the short film Fifteen. Radio credits include: Maidens’ Trip, Shakespeare’s Vortigern and Rowena, Fabulous, The Caspar Logue Affair, Nyama, Lennon, a Week in the Life, The Believers, North by Northamptonshire (all BBC Radio 4), I’m Still the Same Paul, The Devil Was Here Yesterday (BBC Radio 3) and two years on Stephen Merchant’s Sunday show on BBC 6 Music. Rufus also recently recorded Anthony Hope’s Rupert of Hentzau for Naxos Audiobooks.